It’s time to buy a vehicle. One of the many questions on your mind may be, “Should I buy new or used?” “How do I find a trustworthy Used Car Dealership?” Just like any other part of buying a new car, truck, or SUV, deciding whether you should go with a brand new vehicle or a used vehicle requires a few facts to consider before you make a decision. While many people initially think they need to buy new to get a quality vehicle, buying used has quite a few advantages. Better Price. Of course one of the biggest reasons that people consider buying a used vehicle in the first place is that they are looking to save money. Buying a used vehicle from a quality used car dealership near you is a great way to start driving the car or truck you need while sticking to your budget. Lower Insurance Rates. Drivers of used vehicles have more options for less expensive insurance coverage than drivers of new vehicles. If you are looking to save month to month, considering insurance costs, along with the cost of your vehicle’s finance payments is essential. Less Value Depreciation. Most people have heard that when you buy a new vehicle, the minute you drive it off of the lot, it begins to lose value. This fact alone is a good reason to consider buying a used car or truck. No one wants to invest a significant amount of money into something that does not hold its value well. Buying a used car takes away some of the sting of the way that new cars depreciate in value. More Options to Choose From. When you focus only on new models you are also limiting your options of makes and models to choose from. Used car dealerships have large inventories of cars, trucks, and SUVs on their lots for you to consider. Because they are not bound by the “new” label, used car dealerships can carry many different options. Most dealerships also have access to inventories of cars that they do not yet own, but can purchase and bring to their dealership if you want to buy a specific vehicle. Trim options, engine combinations, and special upgrades are often easier to achieve when you buy used as well. Assured Quality. When used car dealerships find a car, truck, or SUV that they would like to bring to their lot, they run the vehicle through a rigorous check to ensure that their customers are getting a high-quality vehicle. After they get the car into their inventory, the vehicle then undergoes a further inspection by their technicians and is test driven to be sure everything is running as it should. Warranties are still an option with used vehicles as well. Be sure to check the specifics of which warranty conditions your used car dealership applies to the particular vehicle you are purchasing. If a remaining factory warranty is running out soon or does not provide enough coverage for you, most used car dealerships offer extended warranties that are available for purchase. When you are shopping for a used car, you should keep a few factors in mind. Here are a few things that you will want to look into before you sign the papers on a new-to-you vehicle from a used car dealership. Thoroughly inspect the exterior and interior of the vehicle. On the exterior look for dents, scratches, bumper and tail end issues, as well as body rust. On the interior look for rips, tears, stains, and holes. Remember that a used vehicle may have varying levels of wear. However, the wear on the vehicle should be appropriately reflected in the sticker price. Take a test drive. This may seem like a no brainer, but it’s definitely worth mentioning because it’s so important. When you take the vehicle out for a spin take notice of how it handles, how it brakes, is the ride smooth? Take note of any strange noises and be sure to let the dealership know so they can address them and speak to your concerns. Also, check the mechanical aspects, such as rolling down windows, turning on windshield wipers, blinkers, and the radio or infotainment system. Get a vehicle history report. Be sure to ask the dealership to give you the car history report on the vehicle you are interested in. Check for any accidents, recalls, or other issues that may affect the car’s long-term performance once you purchase it. Take it to a mechanic. One of the best ways to ensure you are getting a solid used vehicle is to take it to a mechanic and have it inspected. A good mechanic will tell you any issues they might see that may affect your vehicle’s performance. You can then take this information back to the used car dealership you are buying from and they can address your concerns. Inventory. Take a look at the dealership’s inventory. If the selection looks to be full of a bunch of vehicles that have seen better days, you may want to reconsider shopping with them. Warranties. Have a conversation about warranties with the dealership’s customer service or finance department. A dealership that is confident in its inventory will have no problem offering a nice selection of warranties to help you feel secure about your purchase. Helpful with details. Make sure the dealership that you work with is open and helpful when you ask questions about things like the vehicle title and having an inspection completed. When you are ready to begin shopping for a used vehicle, keep these things in mind and you will be well on your way to owning a great quality vehicle. 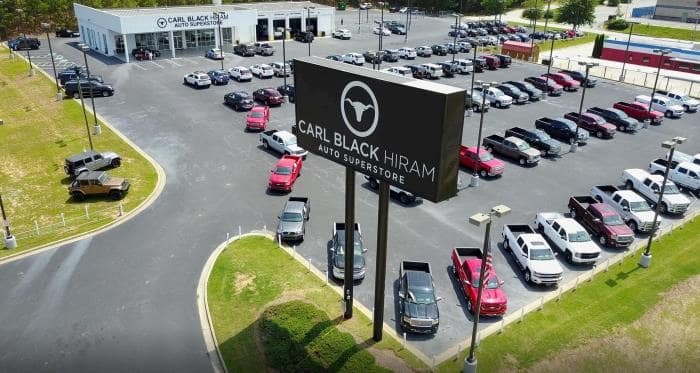 When in doubt, visit Carl Black!